Viewfinder Film Consulting (VFC) is representing 3 official selections at the 17th annual New York Indian Film Festival: “Merku Thodarchi Malai” (Western Ghats), “Oru Kidayin Karunai Manu” (One Goat’s Mercy Petition) and “Sigai” (Blossom). The films have been produced by Vijay Sethupathi Productions, Eros International and Divine Studios, respectively. “I’m thrilled that VFC is representing 3 wonderful films at the New York Indian Film Festival this year! I’m particularly happy that our company has helped to fill so much of the South Indian film bracket with such distinct films! They’re all uniquely entertaining in very different ways. We are grateful to have worked on them and I am really looking forward to being there in New York to share these quality Tamil movies with New York audiences.”- Dilani Rabindran, Managing Director, VFC. While “Merku Thodarchi Malai” and "Sigai" will have their international premieres in New York, both have played at festivals in India. Eros’ “Oru Kidayin Karunai Manu”, meanwhile will have its world premiere at NYIFF. The New York Indian Film Festival is considered one of the strongest annual selections of South Asian cinema. This year’s lineup also includes popular festival hits “Hotel Salvation” and “A Death in the Gunj”. “Merku Thodarchi Malai” Vijay Sethupathi produced “Merku Thodarchi Malai”, which has already garnered awards in India. The film, directed by Lenin Bharathi, has played at 3 Indian film festivals, winning the KW Joseph Award for Best Film at the 2017 International Film Festival of Thrissur. It had a 2.5+ year pre-production process, is based on several true stories from those who actually reside at the borders of Kerala and Tamil Nadu, and features villagers who have had no formal training in acting. 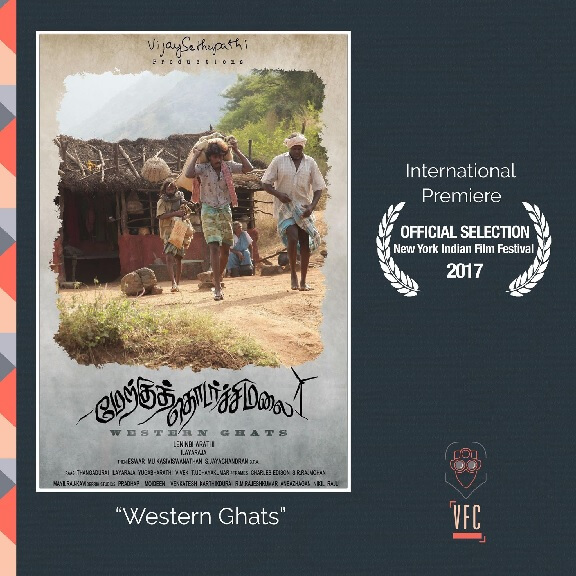 “Merku Thodarchi Malai” plays under its English title of “Western Ghats” on Friday May 5th at 6:30 pm. Director Lenin Bharathi will be in attendance to promote the film. “Oru Kidayin Karunai Manu” “Oru Kidayin Karunai Manu”, produced by Eros International, stars Vidarth and Raveena, in her debut role, and is directed by newcomer Suresh Sangaiah. The film recently had a grand and widely lauded audio and trailer launch event in Chennai. Boasting editing by famed Praveen KL, OKKM focuses on a group of villagers’ holy pilgrimage and an unexpected traffic accident on the way. Director Suresh, a former assistant to National Award winner M. Manikandan, based the story on real-life incidents from his hometown of Rajapalyam. Following NYIFF the film will be releasing theatrically worldwide. 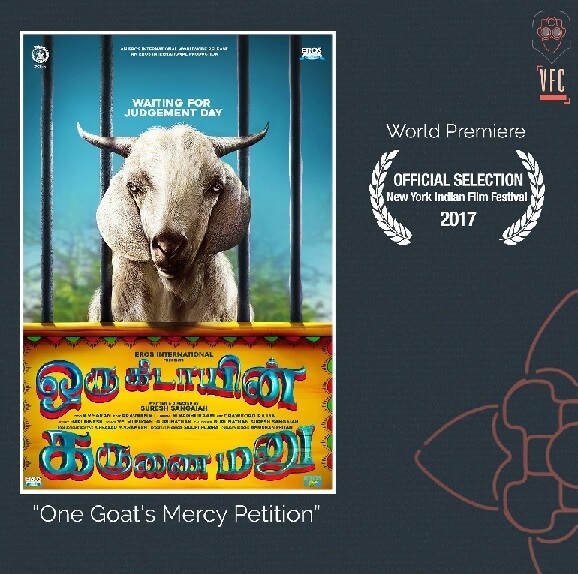 “Oru Kidayin Karunai Manu”, also referred to as “One Goat’s Mercy Petition”, will play at the closing weekend of the New York Indian Film Festival on Saturday May 6 at 6:30 pm. SIGAI "Sigai", directed by first time filmmaker Jagadeesan Subu and produced by Divine Studios, stars Kathir, of “Kirumi” and now “Vikram Vedha” fame. The drama also features Raj Bharath, Rhythvika and Rajesh Sharma, and introduces actress Meera Nair in a pivotal role. Screening under the English title of “Blossom”, the film will play along other great entries from across India. 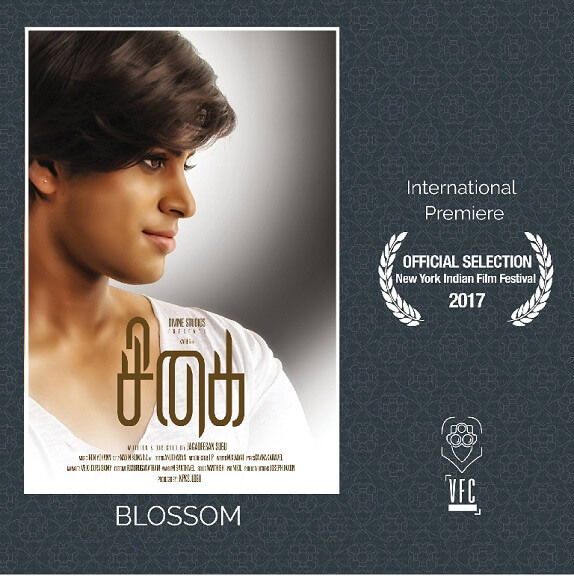 Sigai had its world premiere last September at the All Lights Indian International Film Festival of Hyderabad, where it was also shortlisted for the festival’s Network for the Promotion of Asian Cinema (NETPAC) award for Best Debut Director. Writer and director for the film, Jagadeesan Subu, is an associate of National Award winner M. Manikandan. The film features editing by Anucharan Murugaiyan, cinematography by Navin Kumar and music by Ron Yohann. “Blossom” screens on Thursday, May 4 at 9:15 pm.